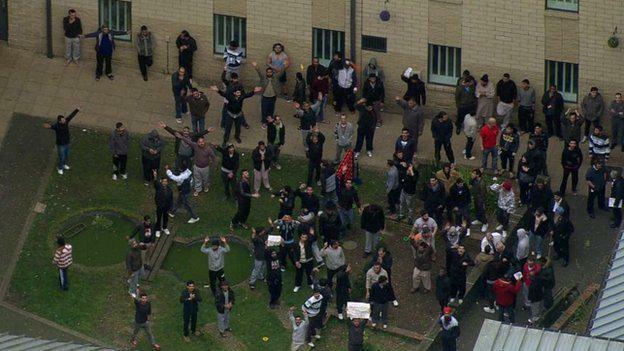 Update: Protests spreading across immigration detention centres in UK. Resistance continued yesterday at Harmondsworth and Colnbrook. Over 70 people detained had gathered in the courtyard to continue the protest. Outside at 9am a group of people made a solidarity demonstration in support of the protests. They could hear people shouting ‘Freedom’ and ‘No Food’. The police were called to the protest and one person was pushed aggressively. Guards and centre managers are asking detainees to go to their rooms and come to talk to the managers one-by-one or in pairs. Detainees have refused and ask the management/staff to come and listen to them in the yard. Take action! Join the resistance! A small group of people can make a lot of noise if they try outside the detention centres at Harmondsworth and Colnbrook! People are gathered in the courtyard and ask for us to go by and support. This entry was posted on Tuesday, March 10th, 2015 at 5:57 pm	and is filed under No Borders.